Moxifloxacin Hydrochloride is the hydrochloride salt preparation of Moxifloxacin, an 8-methoxy-fluoroquinone compound with broad-spectrum bactericidal activity against gram-positive and gram-negative strains. 8-methoxy-fluoroquinones are described to inhibit the activities of Topo II (DNA gyrase) and topoisomerase IV. 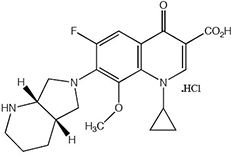 The 8-methoxy group of Moxifloxacin is suggested to confer a lowered propensity for resistance development as compared to other C-8 substituted quinolones, and Moxifloxacin demonstrates potent activity against wild-type and first-step gyrase- and topoisomerase IV-resistant mutants. Moxifloxacin shows activity against methicillin-susceptible staphylococci, penicillin-susceptible and penicillin-resistant pneumococci, penicillin-susceptible and penicillin-resistant viridans group streptococci, group A streptococci, M. catarrhalis, and H. influenzae in vitro.